Discussion in 'Utah Jazz' started by Bulletproof, Jan 27, 2018. The Warriors bring their league leading record (8-2 in their last 10) to Utah to face the Jazz who have won 2 in a row, including a win against the Raptors who stand at #2 in the East. The Warriors have three players averaging over 20ppg (Durant, Curry and Thompson) and look to have an advantage at all but the center position vs the Jazz. The Jazz are 4.5 games out of the playoff race and 5.5 games from the worst in the West. With Gobert's return and the continued emergence of Mitchell will the Jazz push their way back into playoff contention or throw in the towel? addictionary, MVP, 8 and 3 others like this. 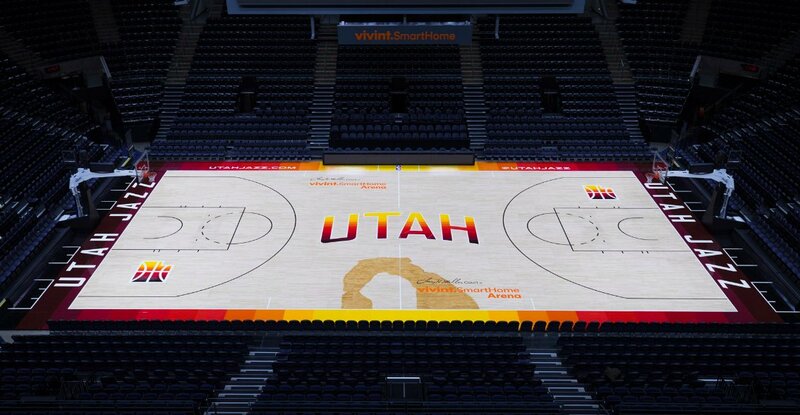 But what I did glean from the pics is that Utah is apparently ready to bust out. jope, LoPo, Hitman and 4 others like this. Will this be the game that debuts the new jerseys and court? Yes, and the new court! I actually thought about buying some tickets for this game but the combination of the new jerseys and playing GS has the ticket prices through the roof. The cheapest upper bowl tickets are $60 right now. The prices for this game are about the same or more than playoff tickets were last year for some reason. Ill either try and win some, watch from home or walk over right when the game starts and buy from a scalper. Really excited to see the new court and jerseys. Not so excited to watch us get murdered by the Warriors. Hope it's competitive at least. It's the purple mountain jerseys, right? jope and Ron Mexico like this. Maybe the W's will be confused by the jersey colors and pass the ball to our players. Man I wish I had tickets to this game. Hopefully it's a close game. They couldn't choose a team like the Kings to show off the new jerseys? fishonjazz and gomretat like this. ...or they can be put back into storage until the Kings do come to town in March. Great game between Boston and GS. W's had to fight back from a double-digit deficit and then barely hung on at end of game. If Hayward returns, Celtics may very well have the better team. Incredible to think that C's were looking a few years down the road, but they're legit contenders right now, even without their $30M man. The Pelicans should trade AD for Hayward and go full-on tank this year. Mail it in. Whoever decided to unveil these jerseys on the night we play the Warriors should be fired. nateboz, fishonjazz and Rubashov like this. It would be better if this game was on national TV to debut the city jersey. I’ll be pretty suprised if the Cavs don’t somehow still push through the east even if they are a mess right now. May is a long way away and a regular season game means nothing in a 7 game playoff series. The only team that has a chance in hell at knocking off the Warriors is the Rockets, and that’s if they can manage 4 great shooting nights in a series. Warriors are still so far ahead of everyone else I don’t think anyone is going to come close to them in a 7 game series, and there’s realistically only about 3 teams that can even get a couple games in a series. Out of a cannon into the sun? We've shown we can beat really good teams. Depends on which team shows up. If Ingles, and Ricky aren't bricking. And DM is on.